“I’m just back in the land of the living, or at least a land where my legs don’t ache and I’ve stopped falling asleep! We did it… 90 miles in all. It was great. Our County President Janet Kettringham and husband Phil have recently returned from a 90 mile walk in aid of the Brain Tumour Research charity in memory of their brother in law Mike. The walk started at Lepton, near Huddersfield where he was born Sunday 28 May and arrive in Bolton-le-Sands on Saturday 3 June, where he lived all his married life. The route took in the sites of Slaithwaite, Scammonden Dam, Hebden Bridge, Hard castle Crags, Worsthorne, Pendle Hill, Clitheroe, over the Forest of Bowland, Caron, St Johns Hospice in Skerton, then on to Bolton-le-Sands….phew! 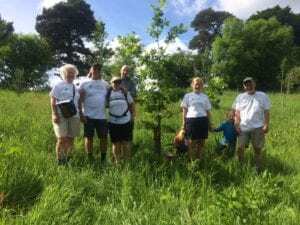 The family planted Mike’s oak tree at Halton, near Lancaster.